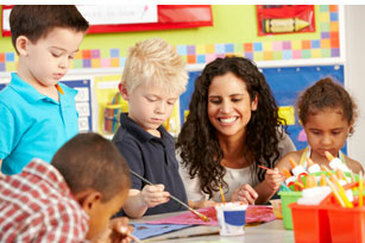 Our Primary Program offers multi-age grouping for children, ages 3 to 6 years. The three-year, mixed-age grouping gives children the unique opportunity to succeed in a miniature community, where they learn to mutually respect, be sharing and caring, and work collaboratively. The Primary environment allows the child to discover and understand the order of his world, culture and universe, while developing skills to enable him to fully participate in them. The prepared primary environment supports the child’s natural curiosity, encourages creativity, and aids cooperative learning. 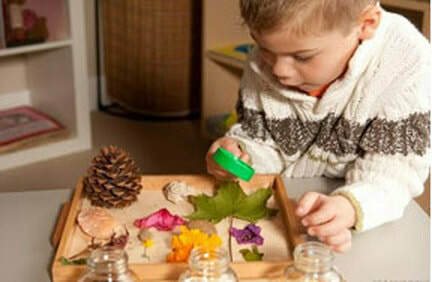 The children are progressed to the primary environment when they are intellectually conscious enough to be introduced to the challenging concepts.Therefore, our primary program provides concrete Montessori exercises that enable children to learn many different concepts at their own pace and level of readiness. Each child is free to choose any work they are introduced to from the different areas of the classroom. The materials in our Primary classrooms are arranged from simple to complex and concrete to abstract, so that the children may learn and internalize different concepts by using these scientifically designed Montessori equipment at their own free will. 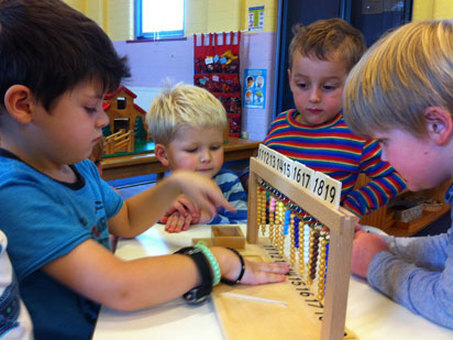 Each piece of the Montessori apparatus is designed to give children a new experience and develop a specific concept. All of the Montessori curriculum materials are available for exploration and mastery. The older children in Primary environment serve as mentors and role models for the younger ones. The younger children are free to observe older children interacting with the materials in the classroom which will arouse their interest to explore the materials, eventually helping to gain knowledge and internalize different concepts. Montessori learning revolves around tangible experiences. Children use concrete Montessori educational materials to learn mathematics; movable alphabets to explore language arts; cubes, cylinders, prisms, and other Montessori materials to understand categorization, discrimination of dimensions, and spatial relationships; and much more. 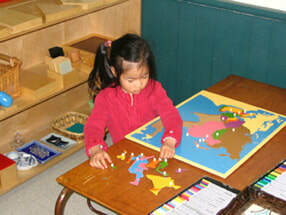 Practical Life Exercises make Montessori environment an extension of home environment. These are the activities which children see in their everyday life. All of these materials are child-size when provided in the prepared environment. These activities begin the control and coordination of mind and body. 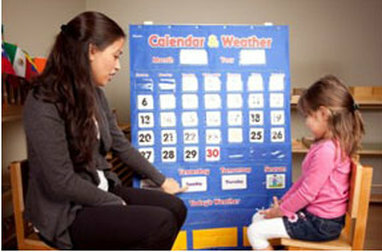 They develop independence, self-confidence, orderliness, coordination and concentration. The senses are the “keys to the universe.” The child understands the entire world around him using his senses. Manipulation of Sensorial materials not only aid to the development of maturing sense organs but also a starting point for the intellectual growth. Working with the didactic (self-teaching) sensorial materials inspires children and sharpen their senses. These sensorial materials include cubes, prisms, cylinders, geometrical solids etc. that help children to categorize, understand dimensional differences, spatial relationship and gradation while providing a base of geometry. By helping children to order, compare and classify sensory stimulation, their intellectual development is greatly assisted and future learning becomes more meaningful. ovide an array of Montessori language materials to develop vocabulary, reading and writing skills. Daily occurrence of reading books to the children provide enhancement in the vocabulary. Enrichment of vocabulary across the curriculum is a constant focus in the Primary classroom. Handwriting is practiced through tracing sandpaper letters, shapes and using chalkboards. Moveable alphabet letters are used for creating words. In our Primary classroom, children experience writing before reading, gaining an ability to create words as they develop reading skills. This strategy is a whole language approach that helps children to become independent readers. 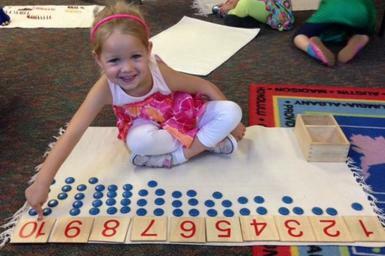 Montessori environment provide hands-on approach to learning Mathematics. The Montessori mathematic materials are concrete and provide children the sensorial impressions of quantities, numbers, combinations of numbers and mathematical operations. These Montessori educational materials also provide children the opportunity to comprehend the mathematical concepts with concrete materials, eventually allowing them to perform mathematical operations in abstract. Science curriculum fosters an appreciation of nature and the environment. This curriculum includes scientific experiments and integrated activities to understand science and nature. The basic skills of science, such as measuring, comparing, classifying, and keen observing, are carefully prepared and practiced in our Montessori classrooms. Children possess a natural curiosity for the known and the unknown. Science and Nature studies include the concept of living and non-living, and an introduction to the plant and animal kingdoms. This study also develops the concept of the different branches of science such as life sciences, physical sciences, and earth sciences. All the concepts are accompanied by extensive classified nomenclature. The study of Science and Nature gives children an understanding of the fact that all living and non-living beings in the universe are interdependent and interrelated to each other. 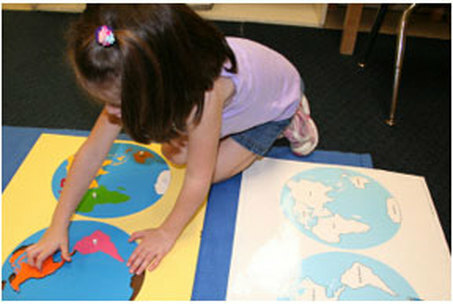 These areas are an integral element of the Montessori curriculum. Cultural enrichment is done through celebrating our national festivals as well as ongoing different cultural events. The children begin to see the world’s cultures in greater depth. They will learn to treasure the richness of their own cultural heritage and those of their friends. Cultural studies cultivate the child’s fascination with the universe and help them develop a lifelong interest in observing nature and discovering more about the world in which we live. The curriculum of cultural Studies includes an introduction to different subjects like botany, zoology, history, geography and more. The concept of what happened in the past; history is first introduced to the children by explaining their own timeline. Books related to history when read to the children give a better and clear understanding of the events that occurred in the past. Different topics introduced in history are then well understood by the children. Young children are innate explorers. 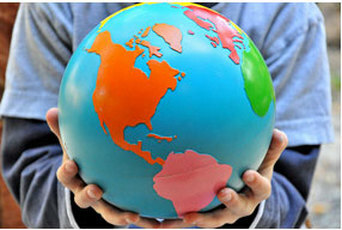 Geographical awareness is gained by using sensorial geographical materials. Geographical materials help make distant lands, diverse cultures and people become a reality. Sensorial explorations of directionality, body awareness, weather, and calendar lay the foundation for geography. The children are also introduced to the diversity of international cultures by means of stories, songs, celebrations, pictures, and artifacts. Children learn the scientific nomenclature of the parts of a flower, tree, leaf as well as different kinds and shapes of leaves. 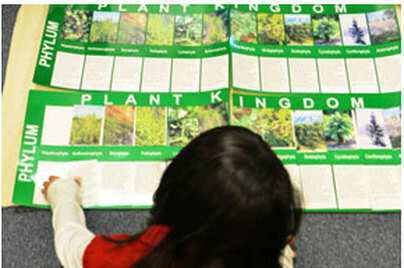 The study of germination gives children the understanding of plant’s need for their growth and survival. Planting in the garden and watering the plants give children firsthand experience of nurturing them and understanding their growth. 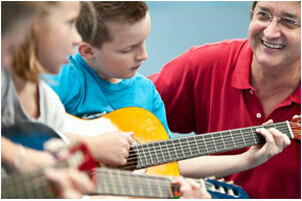 Daily music lessons help the children learn the sounds and meanings of words. Music also helps strengthen memory skills. Movement to music helps children build motor skills while allowing them to practice self-expression. Music and Movement offer children many ways to express themselves, their feelings, experiences and ideas. 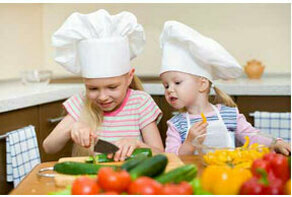 Practical life exercises such as pouring, spooning, sorting and washing dishes provide the base for cooking activities. Children get the opportunity to mix, stir and decorate their own healthy snacks. This gives them the understanding of healthy and nutritious foods with the knowledge of foods that should be part of their everyday meals. Daily outdoor play involves free play and organized games. The outdoor playtime develops gross motor skills as well as social skills. Children learn the concept of taking turns, be sharing and caring, and acquire the team-working skills. ​Spanish lessons are taught by a Spanish language teacher. Greetings, colors, shapes, and songs are part of the curriculum. 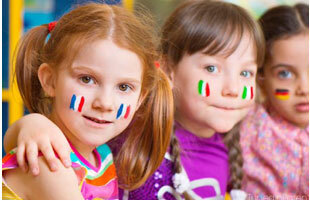 Children will learn Spanish through music, games, songs, stories, art, and culture. 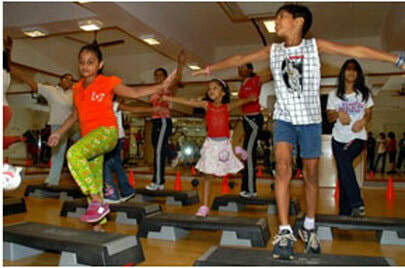 ​Integrated art activities are done with the children to make them understand different forms of art. A range of art materials and activities are available to students. Children demonstrate progression in artwork as their skills develop. Cutting exercises move from very simple to quite complex exercises. Pasting work is followed later by a collage. Coloring with various media such as pencils, crayons, and pastels. Handwork, including sewing, is taught. ​Computer lessons are taught by a computer-certified teacher. 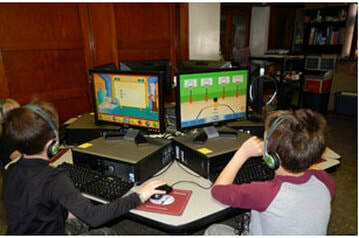 In this class, children are introduced to technology, typing, and software.